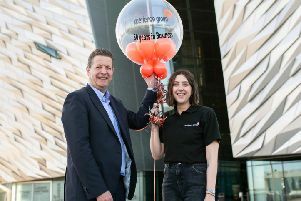 Caption: Ana Wilkinson Cancer Fund for Children Corporate Fundraiser and Philip Morrow Managing Director of PRM Group LTD launch their new charity partnership with members of the company�"s Charity Committee. PRM Group, one of Ireland’s largest Independent Chilled and Frozen Food Sales and Distribution companies, has chosen Cancer Fund for Children as their charity partner for 2016/17. The Lisburn based company which was founded by Philip and Lynne Morrow in 1998 has for a number of years treated families supported by Cancer Fund for Children to trips to see Disney on Ice in their Corporate Box at the SSE Arena, in conjunction with the Rotary Club of Lisburn. This generosity provided families who might not otherwise have had the chance to attend this magical event the opportunity to spend quality time together. A parent of Thomas, a young boy from Lisburn who recently attended Disney on Ice, said: “I just wanted to pass on all our thanks to PRM for the lovely trip we had to the SSE Arena. “We had a brilliant time; the children were totally enthralled, especially Thomas who was riveted to the performance and clapped, shouted and cheered like a good’un. “It was lovely to meet our hosts – they were very good to us and we were very well looked after - we certainly didn’t leave hungry. “It was a total surprise to be invited along and we had a lot of fun. Now PRM Group has decided to take their support of Cancer Fund for Children to the next level by encouraging their staff to fundraise and they have an ambitious target of £10,000. Already over £900 has been raised by the team’s participation in this year’s Belfast City Marathon.